I am so excited for today’s recipe. I made this two weeks ago, and patiently waited to share it with you. Today for #SundaySupper we had to make a dish that we would use local ingredients or finds from the Farmers Market. I am always at the Farmers Market so today’s mission was easy! But then again, with all the wonderful produce, meats, fish and breads, it can be normally hard, but not for me today. I had this idea in my head since m Boss’s BBQ a few weeks ago. My Boss’s wife made a wonderful peach cobbler and I couldn’t get it out of my mind. I needed some peach cobbler in my life, so that weekend, at 5am on Sunday morning I made this most wonderful treat! I am so loving it!! 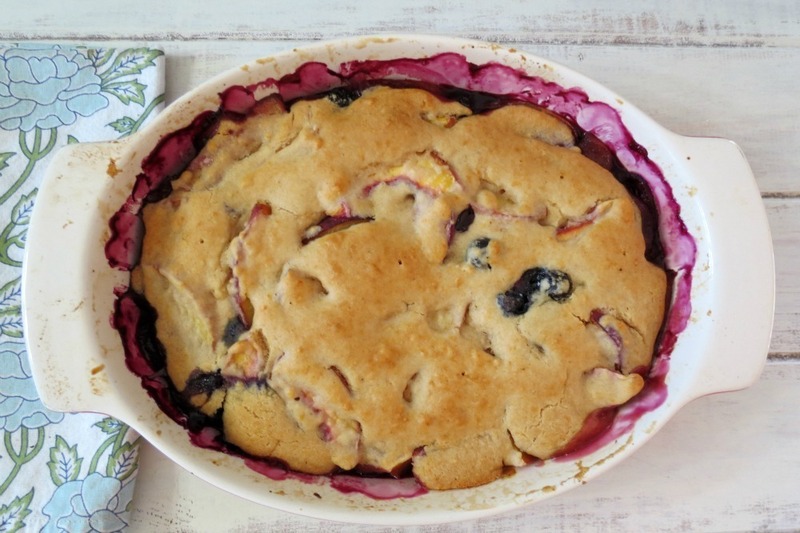 This is my Lightened Up Peach and Blueberry Cobbler! Oh baby is this ever good! I had to control myself by not eating the whole batch! I love it and I used all local ingredients including the sweet honey. The cobbler is sweet, fresh and is so perfect with vanilla bean ice cream. Yum!! I don’t know what it is, but I am on a major peach kick. I normally not big on eating peaches, but there is something about them this year. They are sooooooo sweet, you barely need any sugar with it! Sigh…. I think I heart peaches!!! For the topping, I made a cobbler topping that is pretty light. I didn’t want anything to bready, as much as I like bread, I just wanted fruit! The topping is made with whole wheat pastry flour, a pinch of sugar, Smart Balance Margarine and coconut milk. You can also make this dish vegan by using Earth Balance! 😉 Most cobbler recipes ask for whole milk or cream, but I opted on using coconut milk because it is pretty creamy and thicker that non-fat milk. It worked out like a charm. For the fruit, I used 2 tablespoons of local honey, that tastes amazing, a pinch of stevia and cornstarch. I found my peaches pretty sweet, so I didn’t want to add to much sugar to them. For the topping, I made my batter and then poured it over my fruit and spread it with the back of my spoon. Here it is before putting it in the oven. Here it is fresh out of the oven. I swear my eyes just about burst when I saw it. I am so proud of this cobbler. It’s the best one I have ever made and I have made cobbler before, but with my substitutions, it came together beautifully, plus it’s low on calories. It comes in at only 149 calories! That’s pretty good! 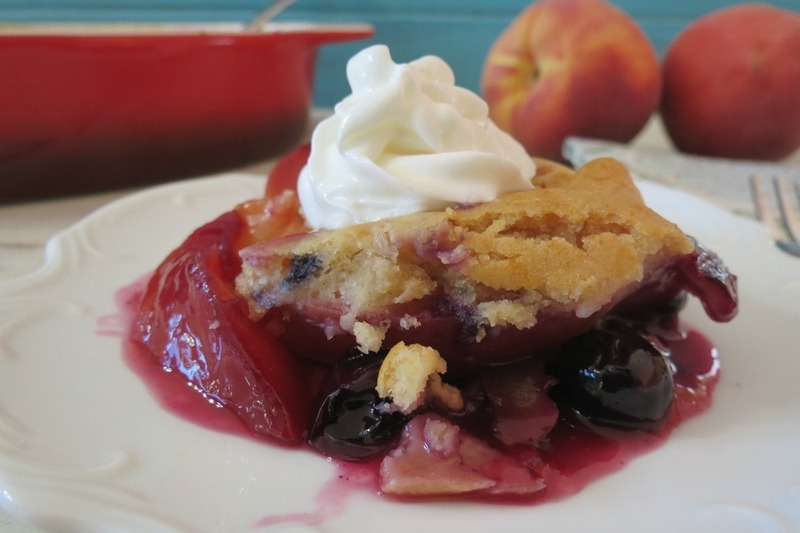 Normal cobbler is around 300 – 400 calories if not more! If you just want to eat a serving of the fruit and skip the topping, you’re looking at 66 calories! I sometimes take the top off when I put it in my yogurt. Yes, I put this cobbler on my yogurt and ice cream. It’s so good in yogurt, dam now I want some!! A sweet, low calorie fruit dessert made with fresh peaches and blueberries, covered by a whole wheat bread topping. Spray a 11 x 13 baking dish with cooking spray; set a side. In a large bowl, combine honey,stevia, cornstarch, and lemon juice. Add the peaches and blueberries; toss to coat. Add fruit to prepared baking dish. For topping, in a small bowl, combine sugar, whole wheat pastry flour, baking powder and salt; cut in the butter until the mixture resembles fine crumbs (I used my hands). Stir in coconut milk, until dough forms, do not over mix. Pour dough over fruit and spread with a back of a spoon. Bake for 35-40 minutes or until filling is bubbly and topping is golden. Ohhh I am excited to see what local finds everyone has. It’s so wonderful to explore other areas and see what they specialize in. Whenever I travel anywhere, I always scope out what is local there. You know local goods are always the best!! Then I stock up if I can and bring it home!! Well my Friends, I am off to do some more cooking. I am on a roll today! This is indeed a keeper recipe, Jennifer. I appreciate the very low content of honey (which I imagine enhances the peaches perfectly.) Love whole wheat pastry flour in the crumble, too. It always add such a nice, nutty texture..Congratulations on this fabulous creation, Jennifer! Your welcome! 🙂 Have a nice rest of the day! This is absolutely gorgeous!! And I can’t believe how light it is – will have to try this for sure! Thank you Marie! I just love these kind of desserts! Yummm yummmm yummmm! This looks delish! You get so creative with your healthy recipes! I want some of this now! This sounds wonderful. We generally don’t eat desserts, but we do eat snacks with Greek yogurt and fruit. These peaches sound perfect. For those who have not yet discovered Greek yogurt with fruit, it’s a wonderful snack. LOVE that you lightened this dish! Now I can eat it and not feel so guilty! I adore peaches & blueberries together. This looks fabulous! I love your minimal use of sugar/honey/stevia ! Let the fruit shine ! When fruit is at it’s peak, it has enough wonderful sugar content all by itself. And I love your topping with the coconut milk. I’m going to use this recipe on my next cobbler. Cobbler is a staple here in Texas, but our peach season wasn’t good this year…we had a late cold snap :(. 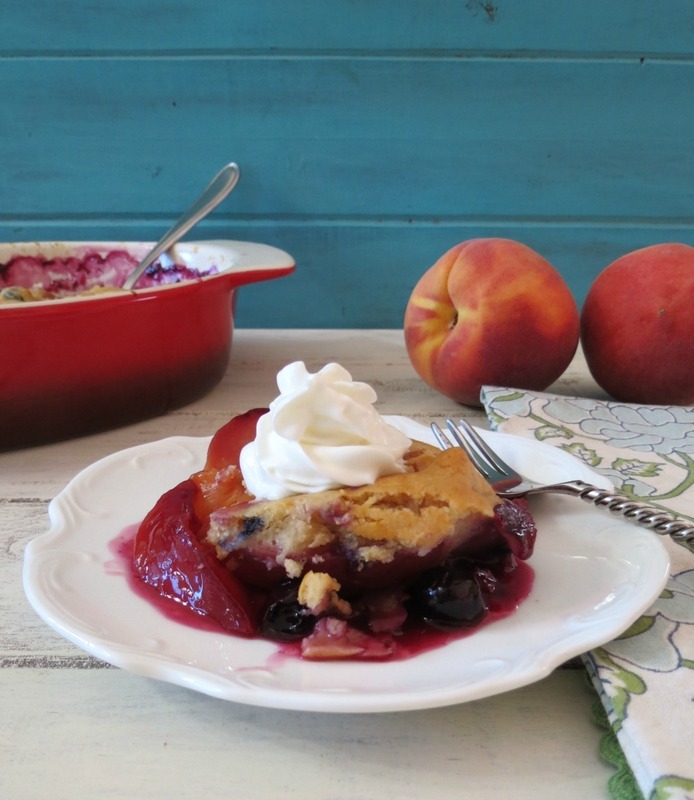 I’ve been having to use berries or apples instead…great, but nothing is quite like peach cobbler!! I just love how the dough blankets the filling! And coconut milk, that´s a brilliant idea Jennifer! Peaches and blueberries go so well together. Really gorgeous recipe. I loved that you made this a light recipe, and it looks so easy. The photos are lovely. I pinned your feature photo to the “Berry Love” group board on Pinterest. Any kind of cobbler is comfort food. 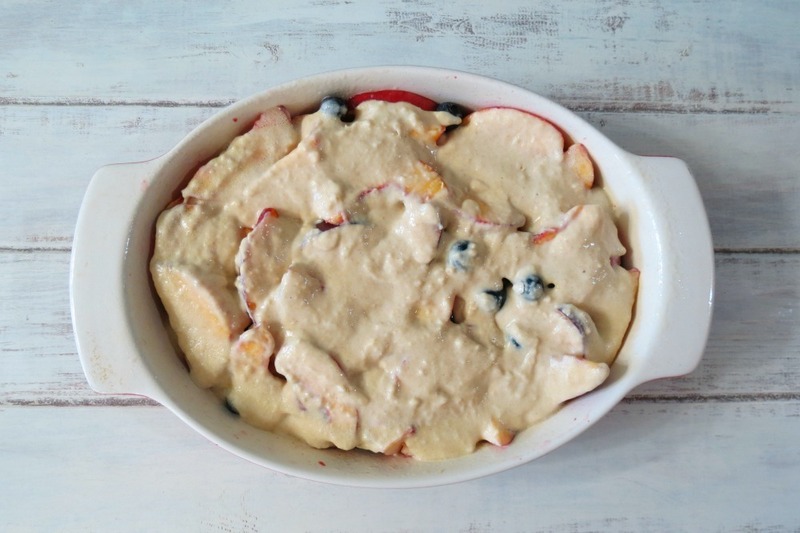 Warm, sweet peaches and blueberries with a lovely topping like yours would be perfect with a little ice cream. Or heavy cream. At our house, we tend to put lashings of heavy pouring cream on everything. I love the way you’ve lightened things up, Jennifer, but still made it delicious. 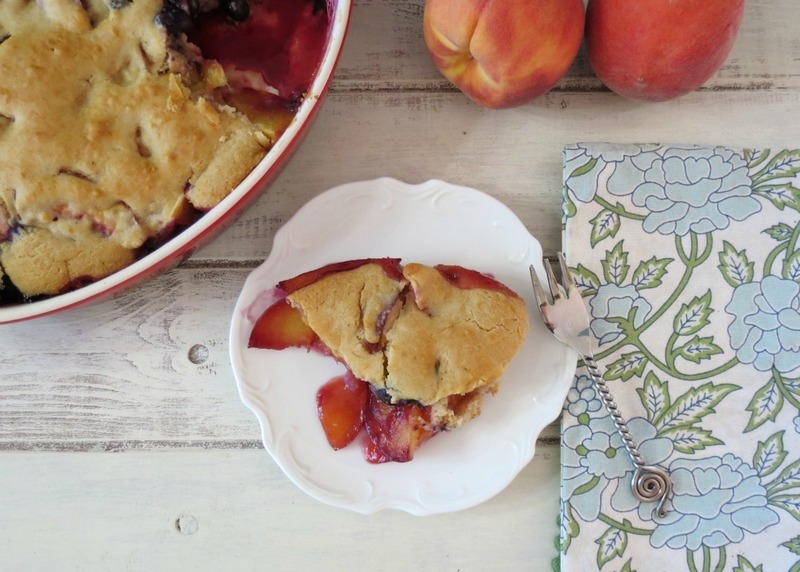 Your cobbler is making my mouth water…and you’d never guess it was a lightened up version! Beautifully done! This is so pretty! I always love a good cobbler. I am loving all of the fruit this summer. No better way to use it than in a cobbler. This looks absolutely wonderful – I am pinning and making this asap! I bet the wholewheat crust is delicious. So, is it okay if I pair a fattening scoop of ice cream with this!? Mmmmmm…..
Oh my gosh! I love love love peaches and blueberries together! I like to put both in my oatmeal. I would love this cobbler! Oh, it turned out beautifully! You just never know, do you? I’m sure it tasted just as delicious as it looks. WHAT?! 149 calories?! Jennifer, both my tastebuds and waistline thank you for this recipe (and it’s rare that ever happens!). Your cobbler is gorgeous and I bet it tasted amazing. Thanks Laura! I love this combination of fruit too! Your cobbler looks divine. I can’t believe the calorie count! Woop! I agree! I had my cobbler with yogurt! I just love summer berries! Oh this looks fabulous. I love cobblers and a lightened up version is a win-win! You made this at 5am? If I would have made this at 5am, I probably would have mixed up sugar and salt, and yeah…it would not turn out nearly as gorgeous. Pass me a plate of this, please!! I’m an early bird! I get up at 3:30 am M-F for work and on the weekends, no matter what time I go to bed, I always get up around 3:30 – 4am. It’s crazy I know!! Ahhhm thanks Jane, let me know what you think! Love the blueberry and peach combo! Beautiful! Thank you Sarah! 🙂 I love the combo too! 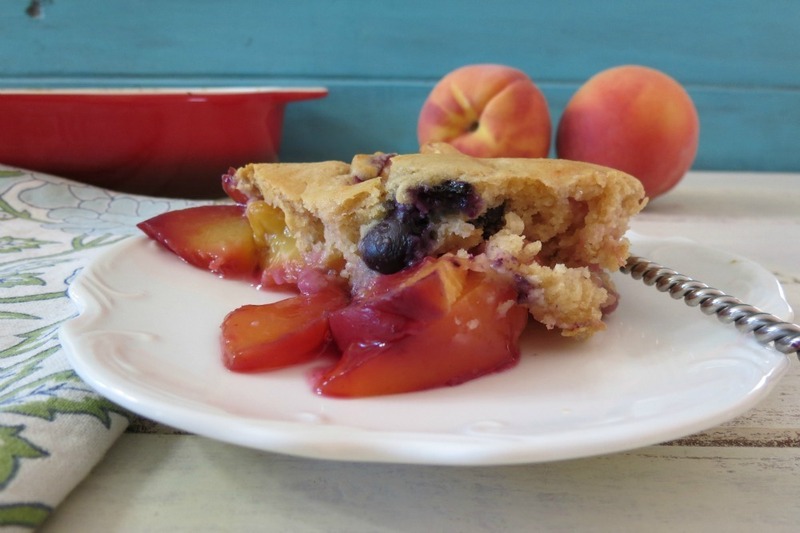 Peaches and blueberries in cobbler sound so good together! Thanks Cindy, I love the combination of blueberry and peaches! Yummers!